It has been cold, rainy, dark and dreary these past few days. . .
not that anyone in Texas is complaining after the drought we went through this past summer. Growing up, my dad LOVED spending rainy Saturdays "nursing" a pot beans, a chicken soup, or a big batch of stew! 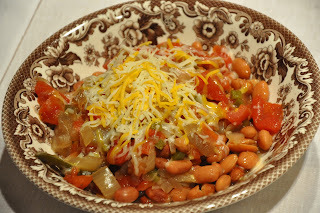 With that said, I knew he would LOVE these slow cooked pinto beans! Soak beans overnight. Put everything in the crockpot together. Add water until it's a couple of inches above the beans. Cook on high for 2 hours. Switch to low for 6-8 hours. Stovetop: boil everything and then turn to medium heat. Cook for 2 hours, stirring occassionally. Top 'em with cheese, sour cream, or green onions. Serve with tortillas, rice, or cornbread.